When the retired Navy tanker Willamette passes under the Carquinez Bridge this week, it'll be just the latest reminder that we're drifting toward the end of an era. Keepers of the U.S. government's National Defense Reserve Fleet anchored in Suisun Bay say that they're about two years ahead of schedule in clearing out ships that no longer have a future on the high seas. 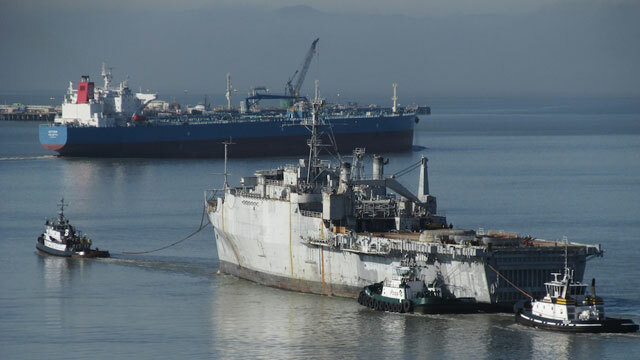 The Willamette's final voyage, under tow to a Texas scrapyard, will leave fewer than a dozen ships in Suisun Bay designated for "non-retention," which means that the government has no plans to use them, even in a crisis. About an equal number of ships that could still be revived will remain behind. 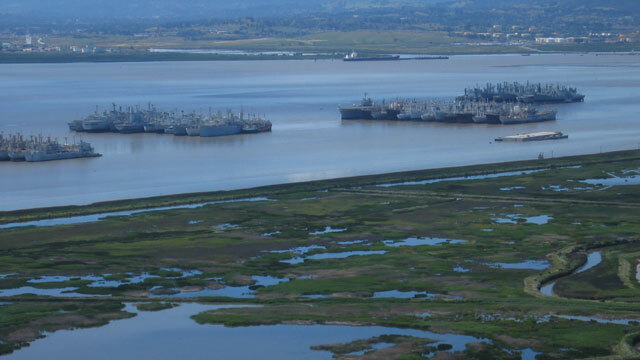 At its peak, in the Cold War environment of the early 1960s, there were more than 500 ships "mothballed" at Suisun, which is just northeast of San Francisco Bay, near the town of Benicia. More than 100 remained as recently as 1999, when the Clinton administration downsized the Navy, according to Joe Pecoraro, who manages the Suisun fleet for the federal Maritime Administration, or MARAD. The anchorage lies cheek-by-jowl with Suisun Marsh, the largest salt marsh on the West Coast. And as lead-based paint began to flake off of the older ships, leaching toxic metals into the water, and they were seen increasingly as a threat to the bay's water quality, local congressional representatives started putting pressure on MARAD to get rid of the rusting hulks. State regulators and environmental groups sued in federal court under various environmental laws and in 2010, won a consent decree that accelerated removal of the ships and forced changes in the way they were being maintained. Regulators say that it's making a difference. Since crews began removing loose paint and growths from above the water lines, stormwater runoff from the ships into the bay is "much cleaner," according to David Elias, a senior engineering geologist with the Bay Area Water Quality Control Board. Elias says concentrations of toxic metals such as lead, copper and zinc are down 64 to 80 percent in samples coming off the ships. The push came at an awkward time for MARAD. The scrap metal market was depressed and taxpayers were having to shell out hundreds of thousands of dollars to tow out each ship. Each trip includes a mandatory stop at a Bay Area dry dock, where workers blast off and contain marine growth to comply with the federal Invasive Species Act. That's followed by a long tow through the Panama Canal, to a recycling yard on the Gulf Coast. But eventually the scrap market rebounded and now, Pecoraro says recyclers are paying for the ships, rather than taxpayers having to pay the recyclers to take them. That's a boon to Merchant Marine schools like Vallejo's California Maritime Academy, which get a share of the revenues from recyclers. Another tanker, the Mount Washington, is currently being cleaned at a San Francisco shipyard. MARAD has until 2017 to remove the 12 remaining non-retention vessels.